Earlier this week I showed the difference that three months has made in Dixie. I would like to show some of the tranformations that these horses go through. 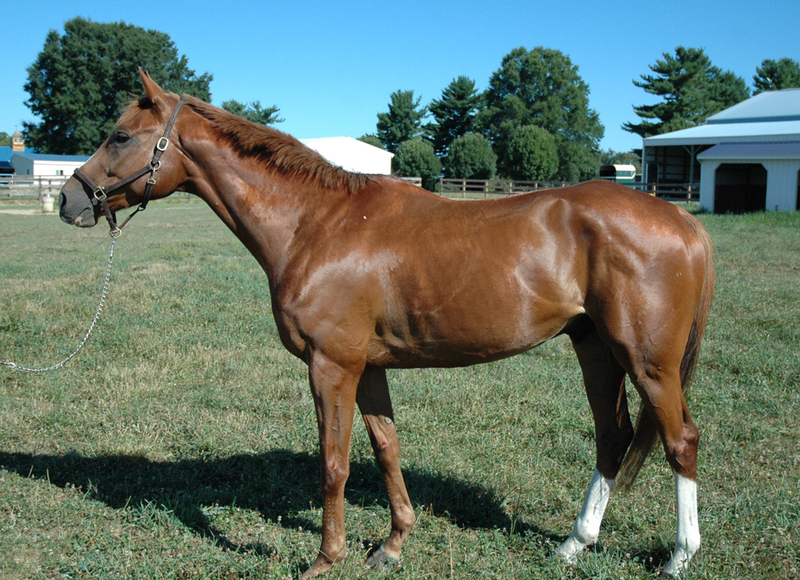 Flint Hill and General Forrest were both 4yr olds and they arrived March 26th, 2007. 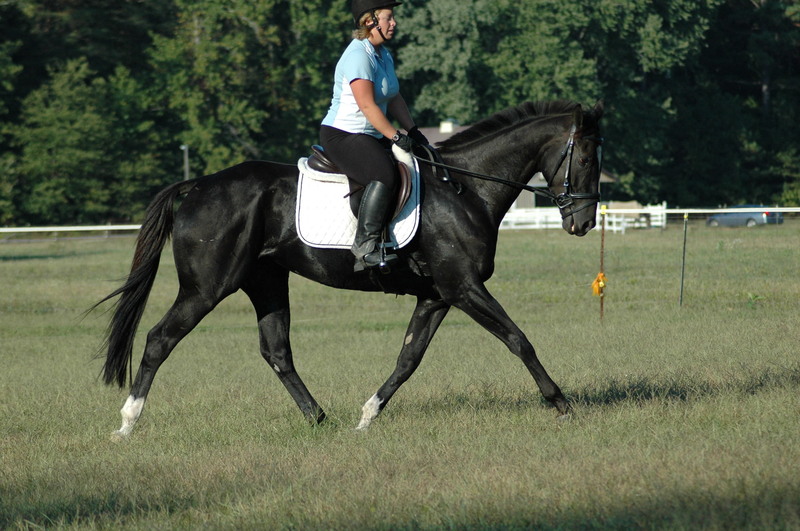 The above pics are of Flint Hill one of the first CANTER horses I was involved with. He didn’t pass his first vet check due to weak stifles..not suprising considering the condition he was in. Very fun transformation to watch this horse and I am lucky enough to still see him because my mom bought him and loves him. First pic in March, Second in May, third in June and then October. I just saw him this week and he is a tank! 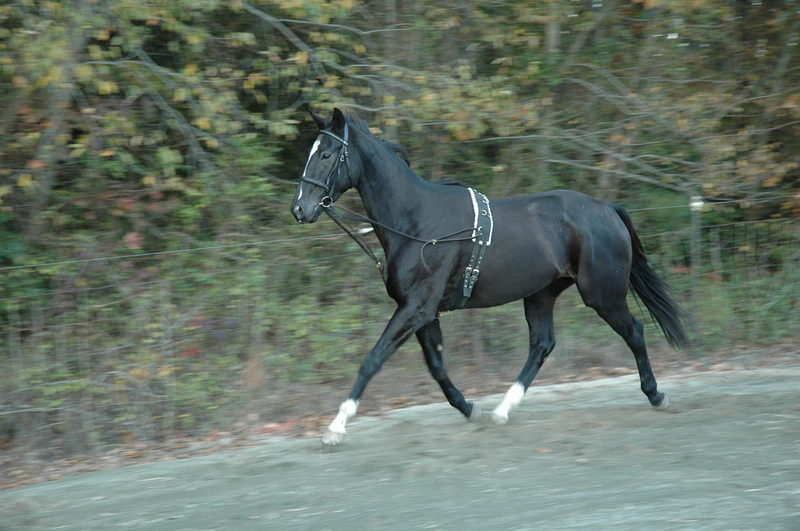 Huge uphill neck with powerful hindquarters. There are people out there who are not trustworthy which is why he ended up so thin. His hair fell out in clumps, wormy belly and he was so thin it was painful for him to be touched. 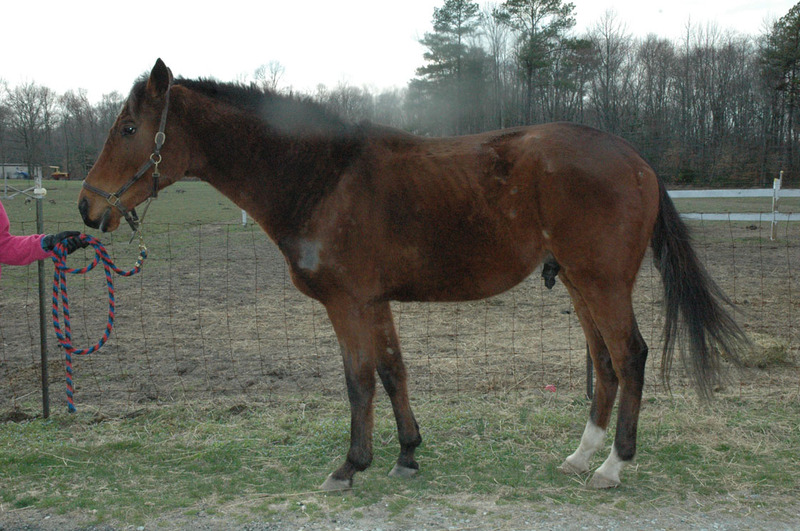 This is General Forrest very cute and only two months of the track when he arrived with Flint. I can’t say he ever really got as much weight on him and he was not a fan of the dressage work as much as some of the others 🙂 This boy was so terrified of jumping when he arrived it took me three months to get him over a pole on the ground. I would have gave him away at that point 🙂 All of a sudden it clicked and he gained his confidence through walking and trotting over lots of low jumps and then adding in low scary jumps until he was out winning the local shows. I don’t remember when Klondike arrived but the first set of pics I have were July 15th. He was quiet but hated contact and liked to go around with his mouth open. He loved to hack around but work was not on the top of his list. Less than a month later he was starting to get the idea. 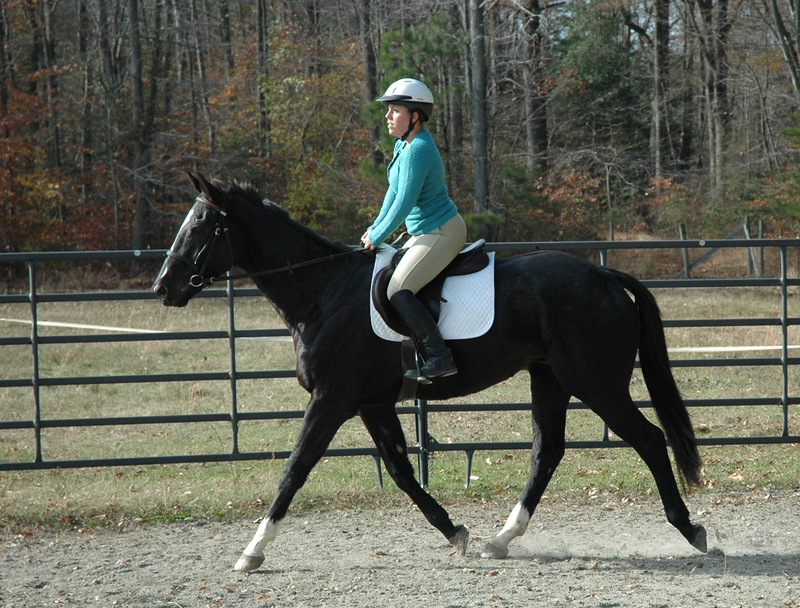 He had gained a lot of weight and muscle when he tweaked his tendon and went back to CANTER. It was fun for me to watch his journey back to riding with Allie and Kelly. He was the coolest horse in the barn. Every time I turned around he had something in his mouth. I have no idea why he looks so different in this next set of pictures because they are only taken five days later but man you can see why I was excited. I think the next ride I jumped him over everything in my ring and you could have not gotten me to stop smiling. We didn’t get pictures because I assumed there would be plenty of other opportunties but I broke my wrist a few days later and was out for the next several months. I could not hold a lunge line but I did a lot of free lunging and free jumping with tavern to teach him about contact and reform his jumping style. He had been a steeplechaser and although he could jump anything he did have his own style. I simply think he had so much scope he didn’t need to worry about his technique! It was fun trying to convince my friends to get on all my horses when they hadn’t been ridden for weeks. I kept them in shape with free lunging but for the most part I couldn’t even put on bridles or equipment so they didn’t retain their muscles like they could have. 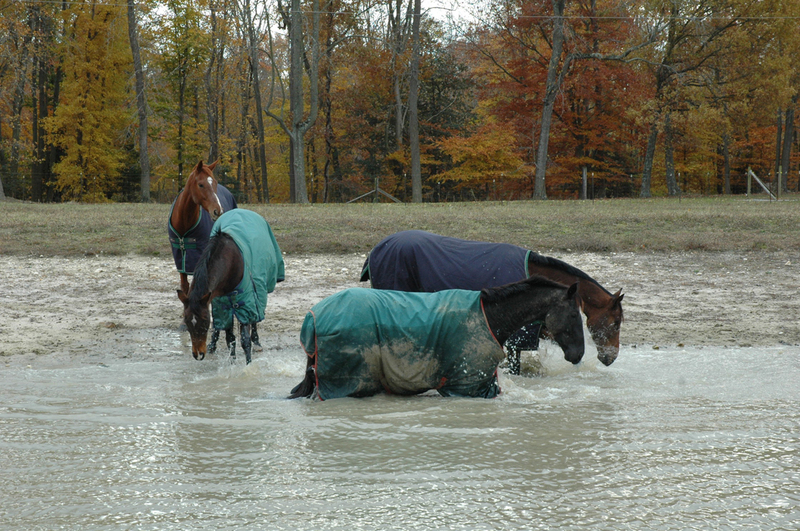 Somehow I don’t think his new owner is having any problems with the water jump because they like to go swimming even with winter blankets on! Next arrival was Indy’s Wolf. Allie came to pick up Tavern and brought me another to play with. I was still wearing my cast but hoping to ride soon. Here I am riding Indy with my cast on. He hadn’t been ridden in at least a year so my husband was sweating bullets and pissed that I was even considering getting on a horse that I didn’t know. But look at Indy..did he look dangerous??? Nice shirt ripped up the arm to make room for the cast that went up behind my elbow! Two months later and he wasn’t much more attractive but getting more muscle and weight. I have posted his recent pics and he looks better each day. These are just a few of the horses that I have worked with but I love showing how they change as their training progresses. I hope these work. I struggle with my video software. I bought a really nice digitial hard drive camera but when I upload to youtube they look horrible. On the camera they look really good so it has to be something during the uploading process that makes the quality poor? One of my favorite things about working with these horses who come off the track is watching them change shape. I remember when Dixie arrived and he looked like a yak with all this long hair and he had no muscle at all. 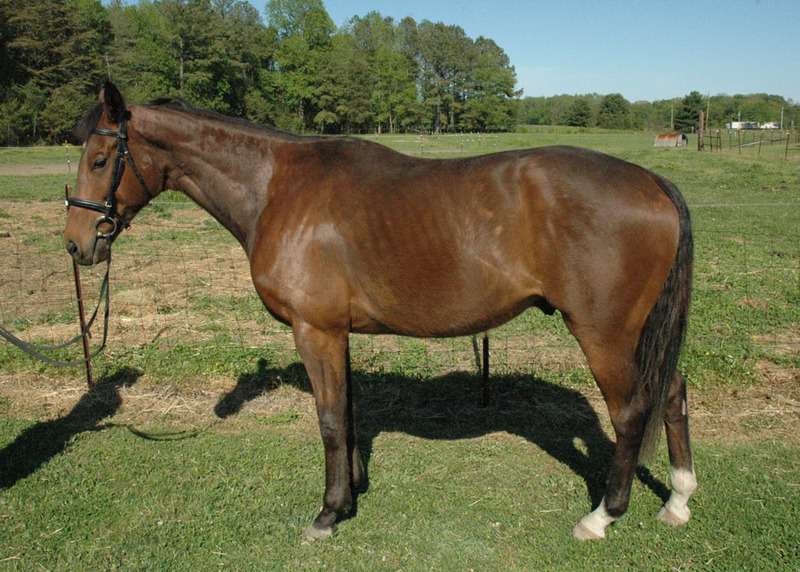 His neck was pencil thin and he wasn’t the most attractive horse I had ever seen. I was browsing through some pictures that we had taken last night and it is so neat to see the amount of muscle he has gained. 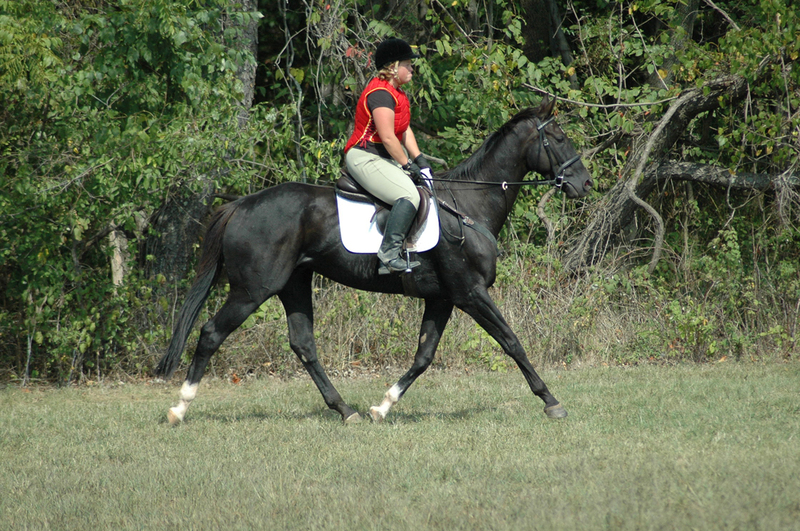 Check out his neck and look at that hind end! Big difference. We took some video yesterday so hopefully I can get that together tonight and post it. I have to admit I felt like my ride was better than my pictures show. I have been taking lessons with a new instructor who has really helped me out a lot. One thing she stresses is making your ride count. Basically, I am a bit to nice when it comes to the training and although it is good that I ride softly I am not asking for enough. During my last lesson with Dixie she reallys said I need to work harder at passively resisting when he wanted to hollow out and pull. Sit up and add the leg and say no you must come here. He has really come along and I do believe we are doing better but I always see things I can improve on. I suppose that is the purpose of pics and video right ?? 🙂 For example, in some of the pictures I am sitting up nice and tall and carrying my hands with a bend in my elbow. I can see in others where I am allowing him to get to low and on the forehand and lean on my hands and other pics where I am allowing him to be above and I need to add the leg and get him a bit more supple in the neck. Dixie has a very good natural balance but he needs to become a bit more supple laterally which will allow him to come across his back better. 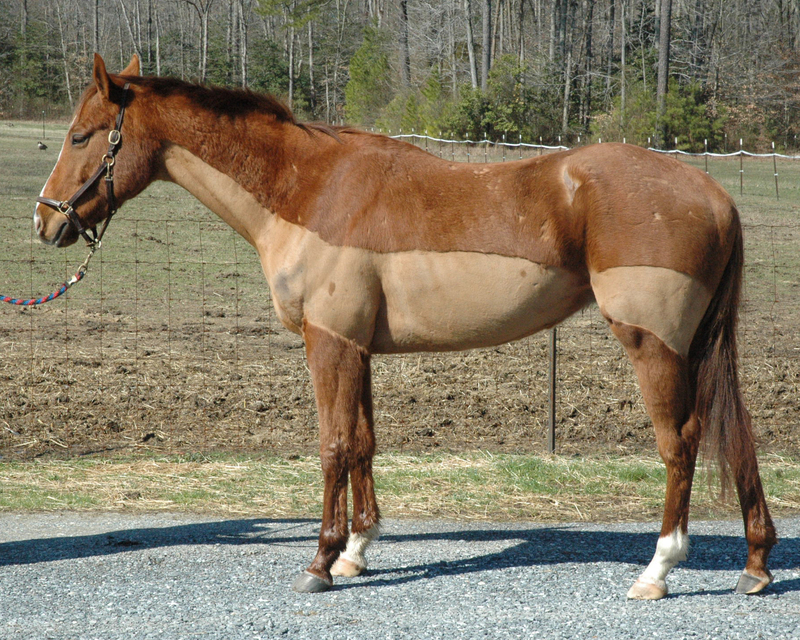 I have been working on a lot of lateral work via leg yeilds, shoulder in, haunches in and more. I like using the circles and switching back between shoulder in and haunches in or just overbend slightly and then counterbend. He gets a bit frustrated because it is hard work but it makes a big difference. One difference I notice is he is becoming more supple on that right side. 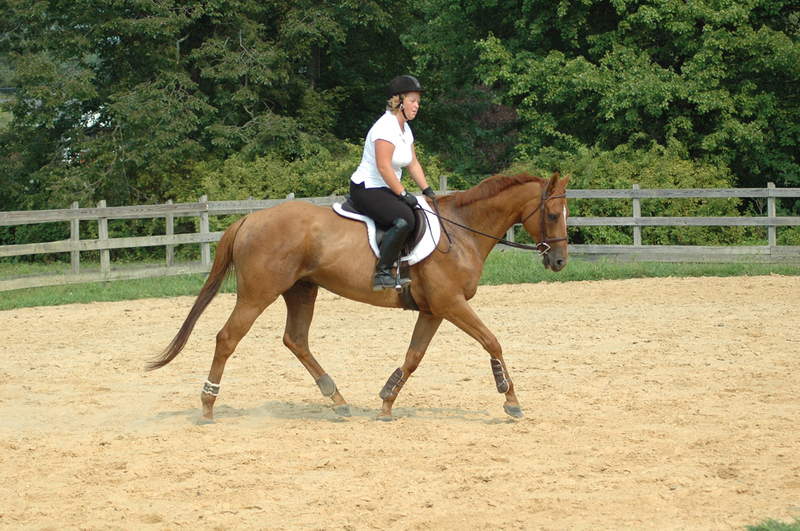 This had improved his canter and we can now canter a circle right without feeling like we are going to tip over. Sometimes it is easy to forget that he only has a few months of training on him because he is further along that some of the young horses would be at this point. I have started to be stricter on myself about incorporating jumping into every ride. Like many others I often do not have any help in setting fences so it is a major pain to get off and fix fences multiple times. I like to start him off low and get his confidence up and then build up the height. 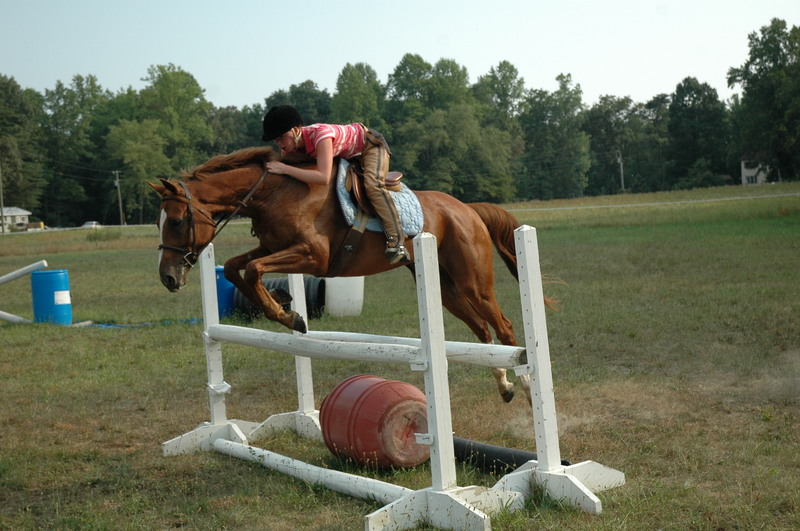 When I don’t do this it can back him off but that is normal for a young horse. For example, last night I did have help so I warmed up over a few x-rails and then a vertical. 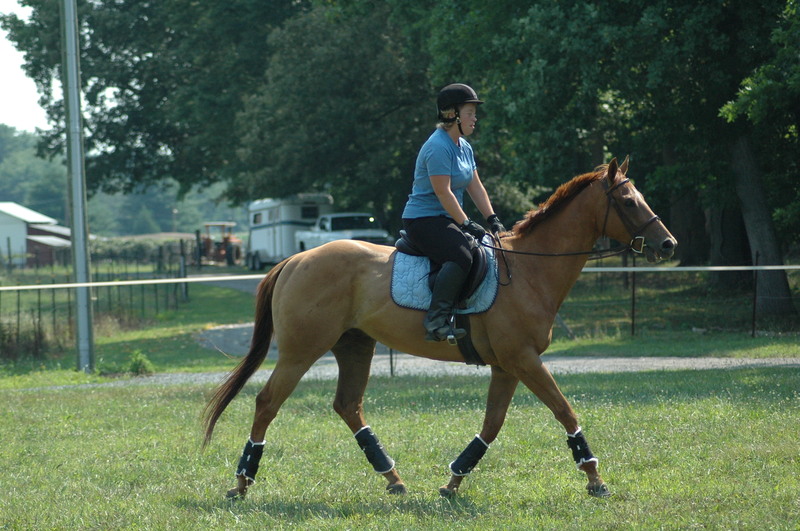 Then we slowly built up a small oxer to a bigger oxer to make sure he was comfortable with each step of the process. 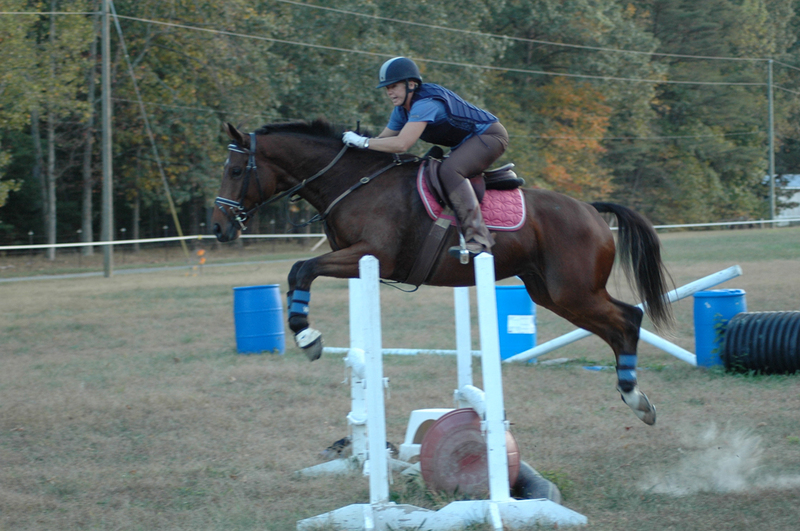 He is very relaxed about the jumps and never in a hurry but he tends to be slow off the ground which illustrates my bad habit of wanting to over fold. 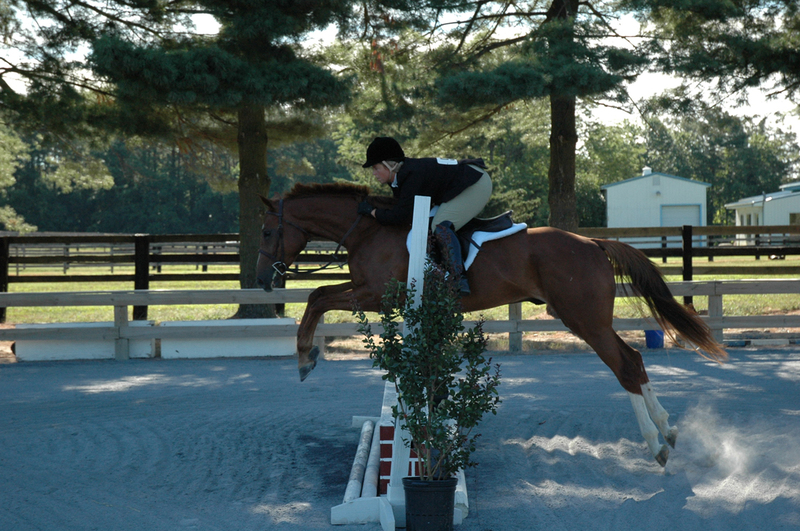 I end up jumping ahead because he leaves the ground slower than most of my horses. Ha, this will fix that habit! Here are some more pictures of him for last nights ride. New horses make me happy! 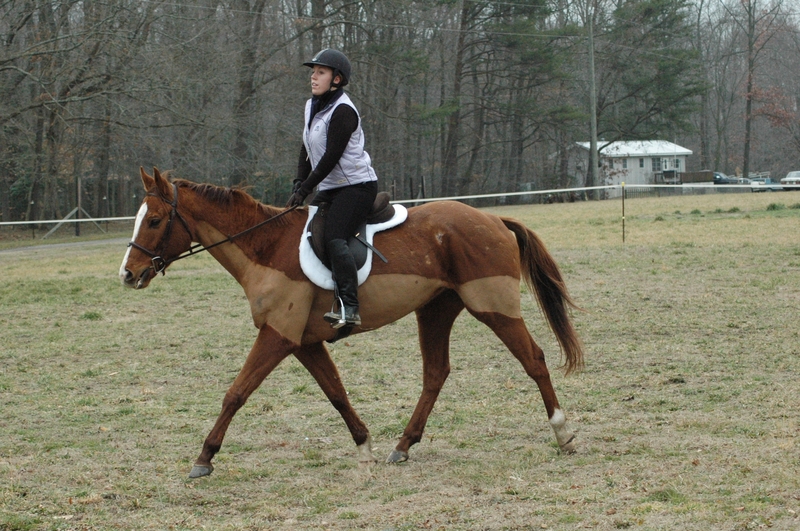 Here are some pictures of the cutie with my friend Tara riding. We are just letting him go around as he pleases right now until he builds some muscle and then I will start asking for a bit more. He is a baby so I take my time. 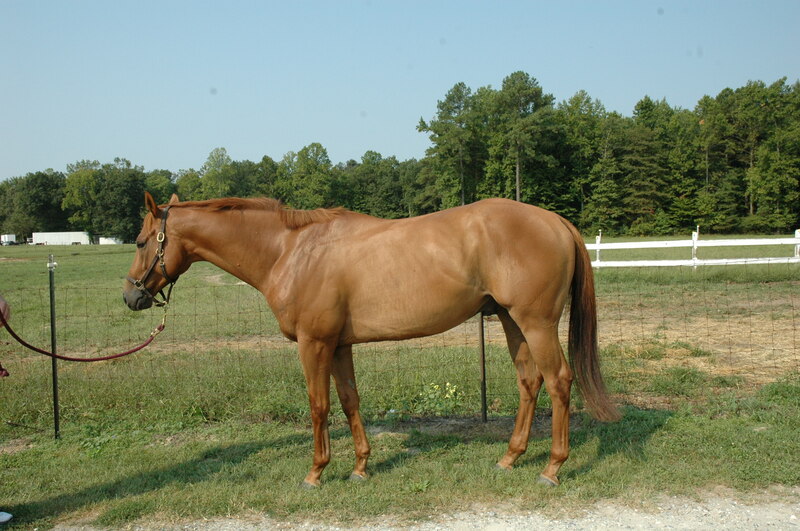 He is for sale if you know anybody looking for a quiet horse to bring along. 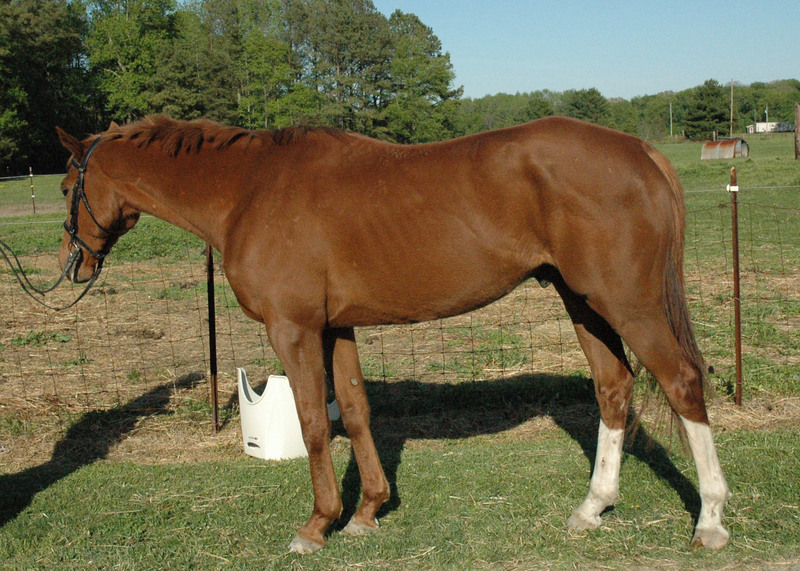 I think he is going to make a great lower level horse and he obviously has shown he loves to trail ride. Indy is just too cute for words. Indy gets rather excited about new things. We did our warm up and melissa’s young horse was showing his excitement at having new horses at his home. Indy was unaffected by his antics and instead was looking here there and everywhere taking in the sights. Indy likes to give his fences more effort because he must find ways to impress you. We finished up without doing the banks. It was so hot and Indy was lathered. He is fit but they are all still adjusting to this weather so no reason to push it. He was a good boy! Indy likes the bigger fences! Today Dixe and Indy got to go visit with my friend Melissa and her two horses. Melissa has a really cute 20 acre farm and she has built a mini-course all around and recently added some smaller jumps for the greenies. She has lots of logs, a coop, a water crossing, a bank, ditch and more that run along the hay field and through the woods. She lives 40min away but I need to get over more often! Dixie- Wow, really I know I talk about him all the time but he just always amazes me. Melissa, my mom and I headed out around the farm to warm up. We all trotted around on loose reins just enjoying the early morning. Dixie gave a few jumps the evil eye as we rode by 🙂 Despite trailering over to a new place with a screaming buddy he was relaxed as could be. Too relaxed? 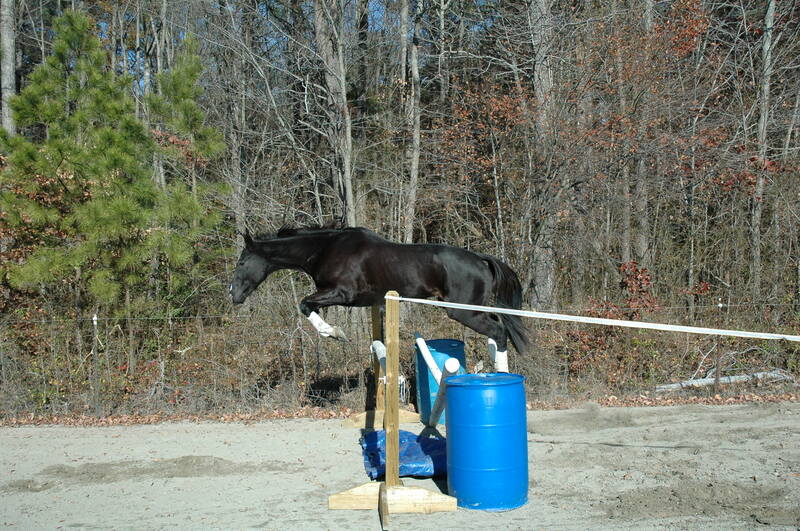 Not sure if there is such a thing but Dixie is totally unimpressed by little jumps. 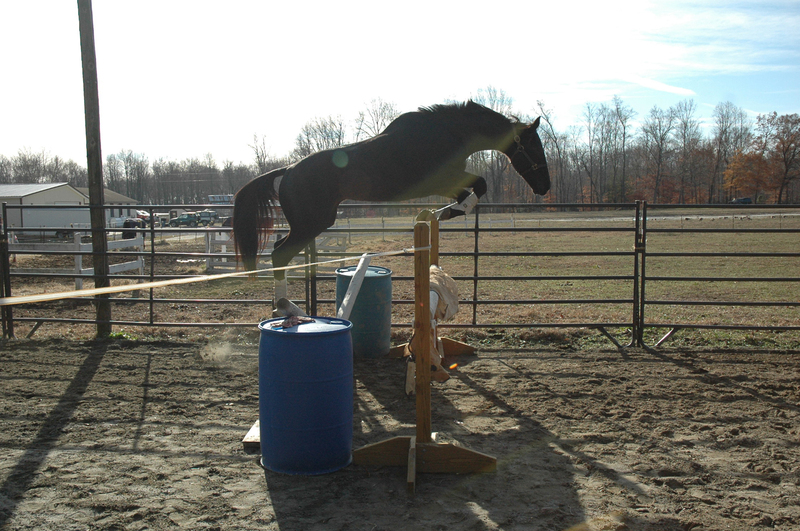 How insulting that I make him go over such baby jumps. I will just trot and canter over them in stride. Did I mention he didn’t even peek at them? Cool horse! This one impressed him slightly..very slight! I walked him over to show him the bank. It was a bigger bank than I would have liked to try for my first time doing a bank with him. I am standing there talking to my mom who is above the hill and all of a sudden he jumped right up the bank 🙂 🙂 Um, great but I was not ready for that! Going down he was very unsure. He started to go but then slithered half down and pulled himself up. I hate that but sometimes it happens when they are learning. Instead of panicking I let him stand and think about it. My mom dropped of next to him to sorta show him. Then I walked forward and he calmly jumped right off. Good boy! He is so trusting and always stops to think about something which I just love about a horse. Most of the time when they slither and scare themselves they just mentally shut down. He was willing to think through what I was asking for me. He got hosed off and went out to hang out to have some grass. Indy is up next. Saturday was lesson day! I have recently started taking lessons with Mogie Bearden-Muller who moved to our area from California. She comes to my barn where a group of us get together for a day of lessons. It was lightly raining but as I rode down to the ring on Dixie it had started to thunder and lightning was off in the distance. Did I mention how sensible Dixie is??? Massive storm with wind and sideways rain and he is just going along like he could care less. She watched me warm him up in w/t/c and then brought me in to talk about him. She liked his balance and remarked that he was forward without rushing and for his limited training he already had a great way of carrying himself but we needed to again work on more connection. Of course the bend to the right is an issue so we were going to address that as well. We started out walking a circle to the left and once again she talked about how I was a very soft rider but could really improve all my horses by taking a bit more connection and starting to establish a more uphill balance (I had been working on teaching dixie to stretch long and low across the back to open his stride). 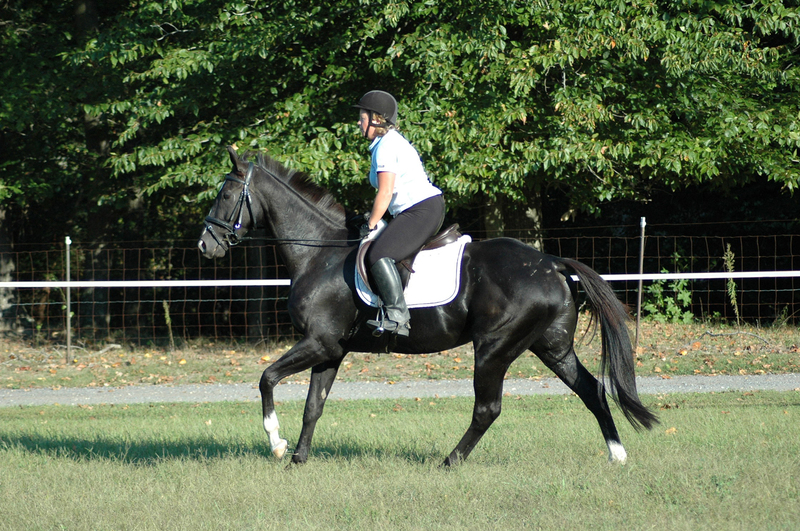 She is a believer in focusing on the hind end to create the larger stride and once you get the hind end working the back is going to have to work. Okay..different method but I am open to learning. 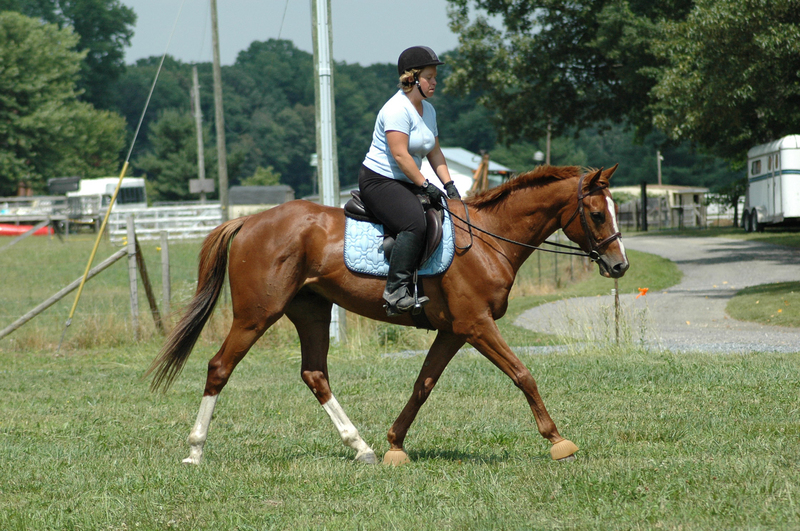 Shorten the reins and add the leg. To the left he wants to over-bend so watch that with little half halts on the outside rein. Be careful to not let him walk out of the contact..meaning let them rush in the walk to evade having to come from behind. He was a bit pissy about the contact. I didn’t feel like I was at all tight but he was saying nope don’t understand. I was just patiently asking with the leg for him to step into the contact. He is smart and started to understand that I wasn’t going to let go and he then marched right into the contact. Of course we had to revisit the concept often but she was really tough on me to passively resist when he tried to yank me (one of his favorite evasions is to pull up with his mouth open) and just close the leg and a little sponge on the inside rein to ask for a bit of flexion. I find Dixie to be very mannerly when he is confused. I can almost feel him thinking and trying to figure out what I am asking him to do. We basically did the same thing at the trot. By the time we started trotting it was pouring. Mogie was covered in a rain sheet and I had water just pouring off me. Dixie was just working like he had been doing this forever. Meanwhile, it’s thundering and we can still see the lighting in the distance. While going right he was very resistant to moving over in a bit of a leg yeild away from the inside leg. He wanted to throw his head up and say nope can’t move over. Can’t bend right. I kept asking and we got some really nice moments and some very soft bend. Next we went to work on some jumping. 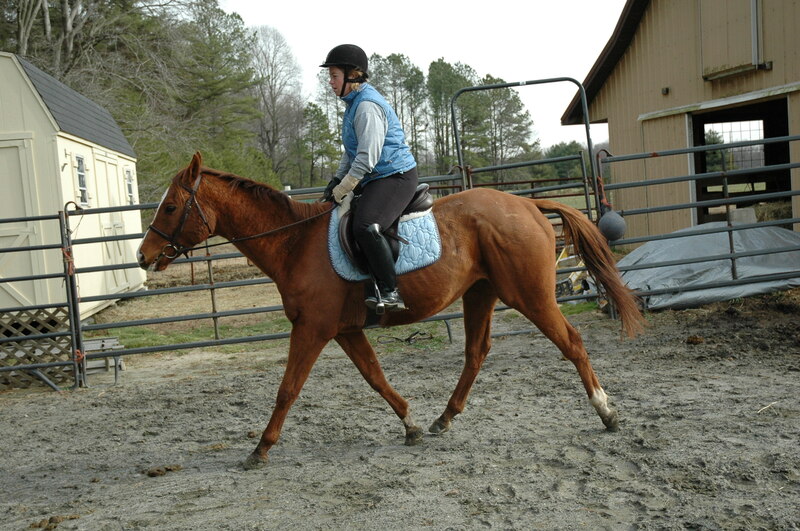 She laid down 4 ground poles and we walked and then trotted through those just working on staying slow and relaxed. Then a 9ft pole, x-rail and I forget what the distance on the landing pole was. 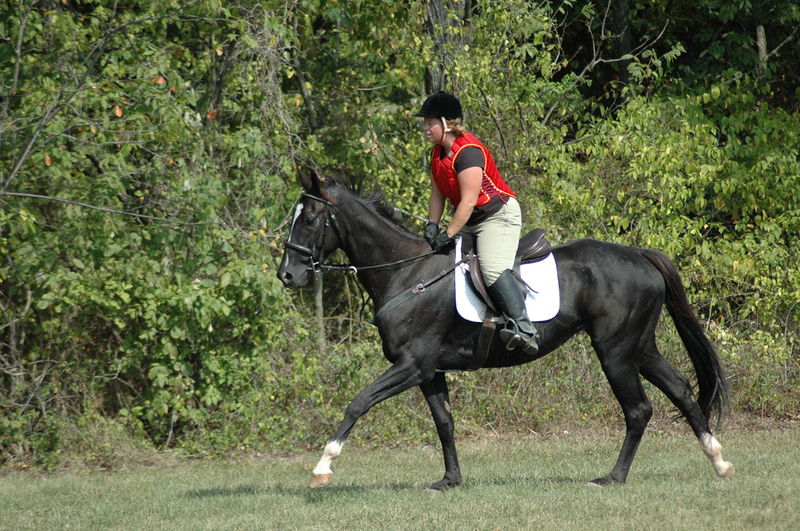 She wanted him to trot in and land cantering out stretching to meet the pole. 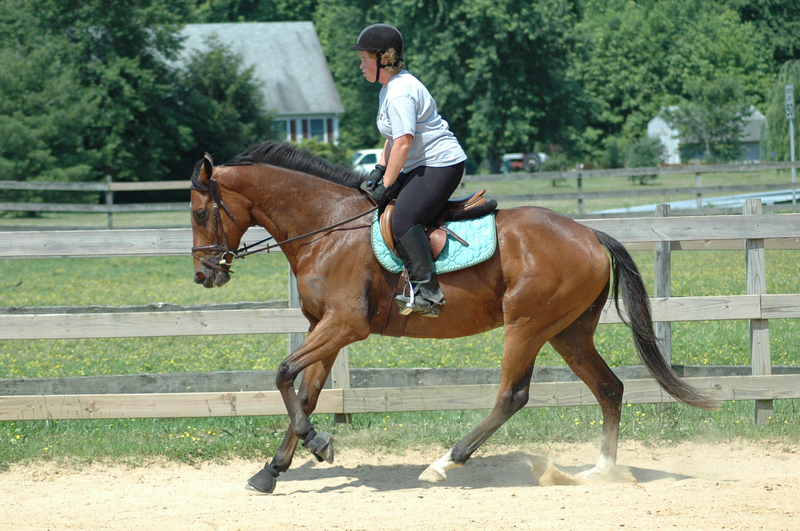 He wants to be a bit short in the canter so that was the point of the pole was to stretch him out upon landing. Dixie is for sale (although I admit I have not marketed him yet) so if anybody is looking for a super nice horse I believe he has great basics and is ready to move on now. I enjoy him so much I keep wanting to do more and more with him instead of selling him but the point of the program is to re-home the horses we have trained so we can have the funds to do the same thing for the rest of the horses who are donated to CANTER.